Facebook has finalized a lease for all of Burlingame Point, a brand new 803k sf office campus currently under construction in Burlingame. Situated on 18.13 acres at the edge of the San Francisco Bay, Burlingame Point is a best in class office development by Kylli, a wholly-owned subsidiary of China-based Genzon Investment Group Co Ltd.
Facebook first publicly announced the lease was in negotiations to the City of Burlingame Planning Commission in August and the lease was fully executed shortly thereafter in the fourth quarter of 2018. Mike Moran and Clarke Funkhouser of Cushman & Wakefield represented Kylli in the transaction. JLL represented the tenant. 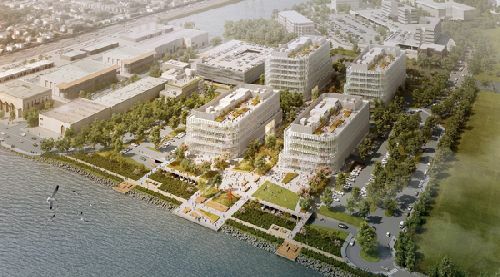 In addition to four new Class A office buildings with bay views, Burlingame Point will include public amenities such as an improved Bay Trail, a vibrant pedestrian promenade, and a safer roadway for cyclists and motorists. Fisherman’s Park also receives a facelift as a result of the project. Expected to open in 2020, Burlingame Point is the first Class A office campus developed by Kylli in the Bay Area. They also own 225 Bush in San Francisco (former Standard Oil Building) and 43 acres in Santa Clara currently going through re-entitlement for a very large mixed-use office, retail and residential development.